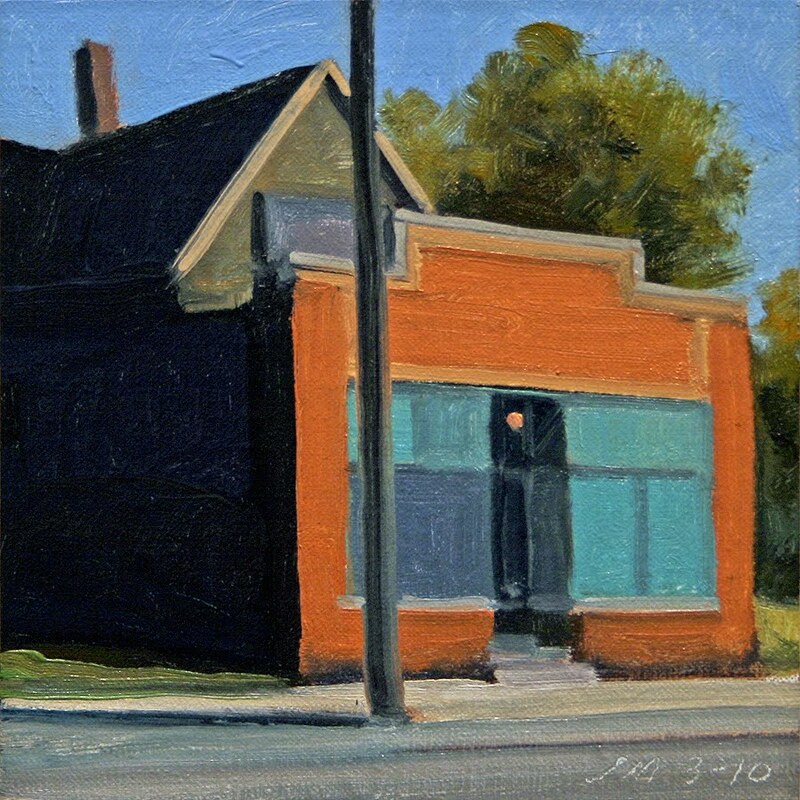 Today's daily painting is an urban landscape of an interesting storefront on Chene St. 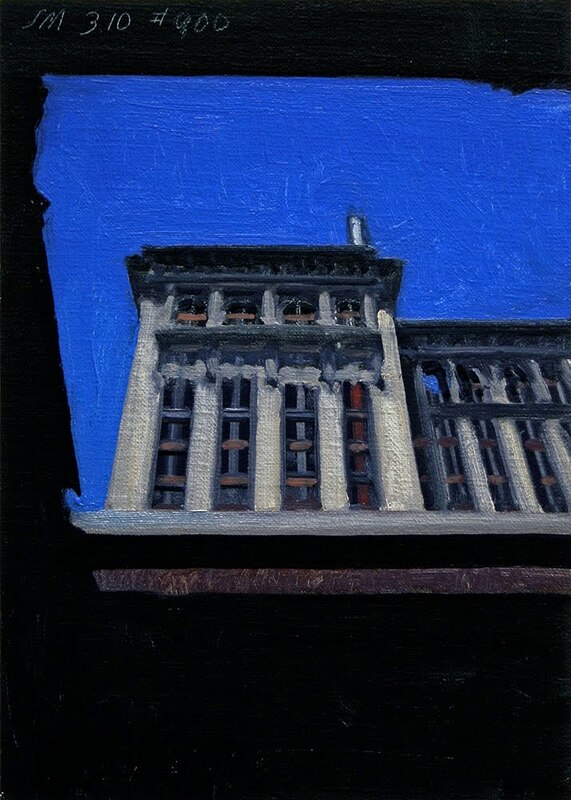 This is a very bad area of Detroit, this building looks like it is being worked on and had a light on in the doorway. 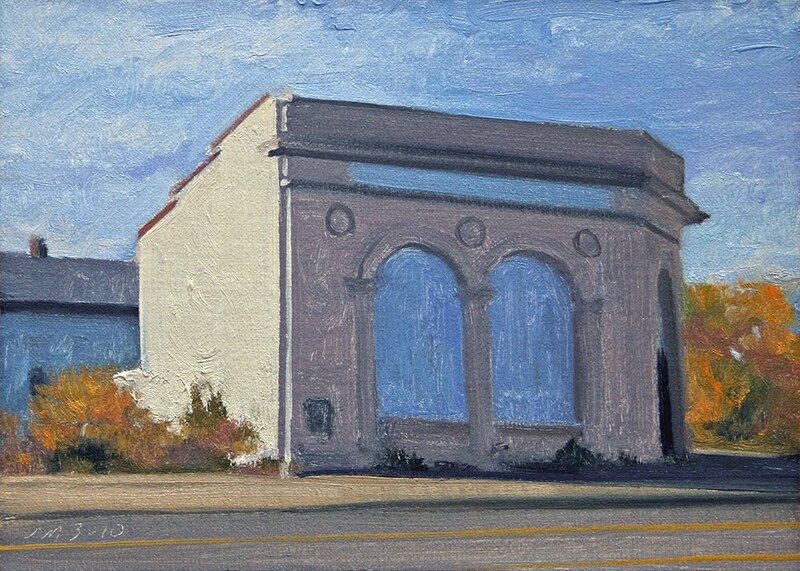 Hopefully a new start for someone..
Today's daily painting is an urban landscape of a building with a wonderful shade of pale blue on the arched windows and door. 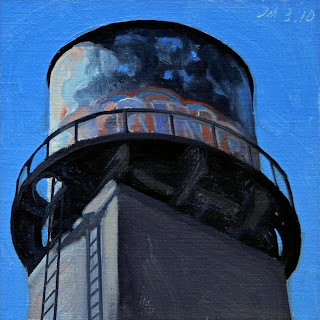 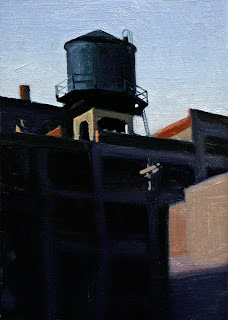 Today's daily painting is an urban landscape of a downtown watertank and shadows. 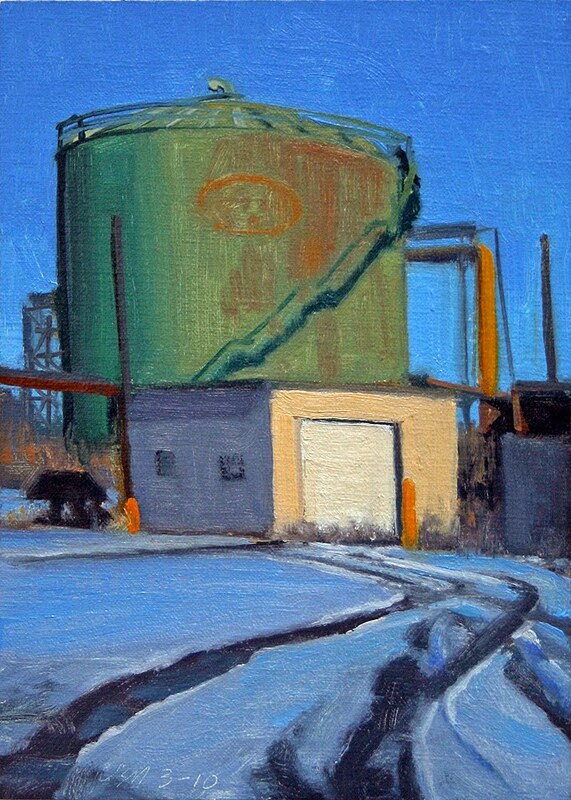 Today's daily painting is a downriver winter landscape of a wonderful green storage tank and out buildings with tracks dancing in the snow. Onion Roll Deli Oil on linen/panel, 2010, 7"x5"
Today's daily painting is the tenth in the Michigan Central Train Station series. 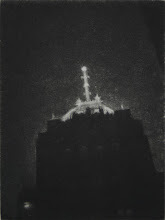 I thought it was approciate for today's post. 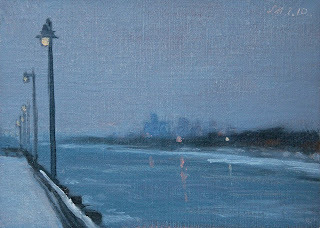 The 900th daily painting, another milestone. 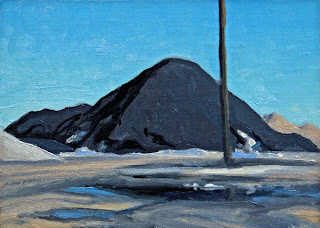 I get from you, my dear friends, collectors, and fellow artists. Today's daily painting is an urban landscape of houses in strong sunlight. 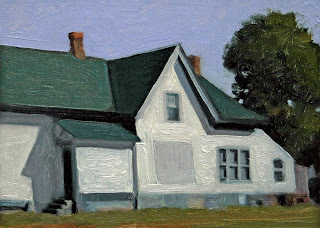 I think the hedges add and extra element to this scene. 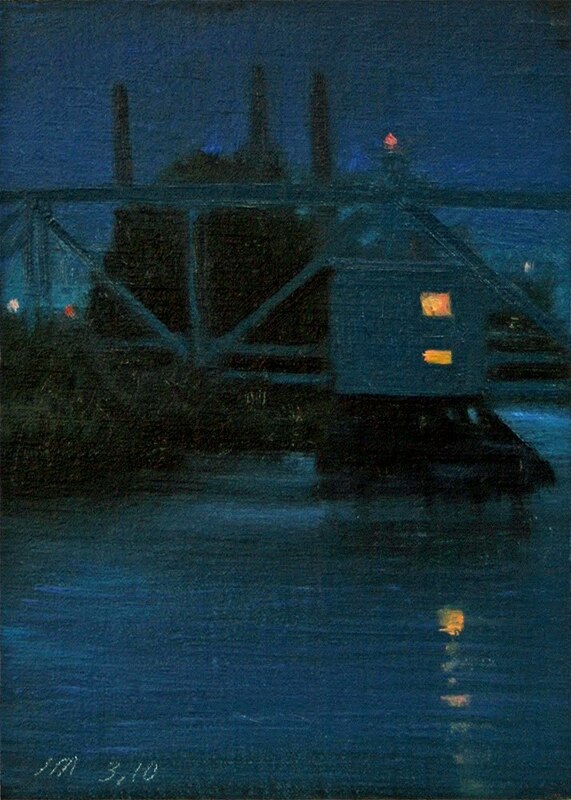 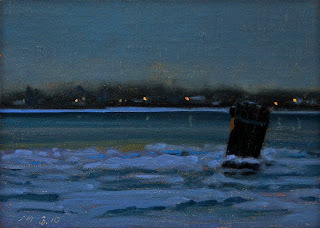 Today's daily painting is a nocturne of the swing bridge at Zug Island over the Rouge River. 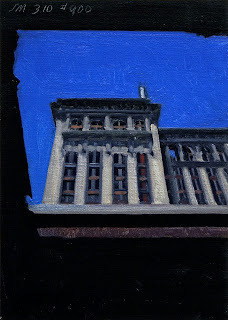 Today's daily painting is an urban landscape of a detail of a Center for Creative Studies building at dusk. 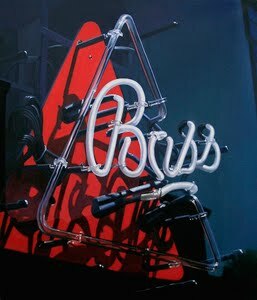 It was designed by W. Kessler & Assoc. 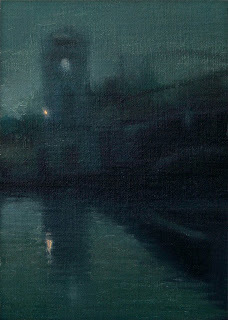 in 1975. 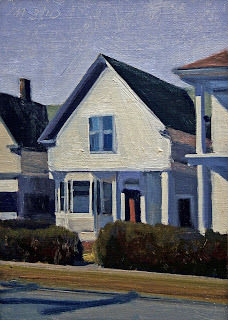 Today's daily painting is an urban landscape of a white house in bright sunlight creating strong shadows. 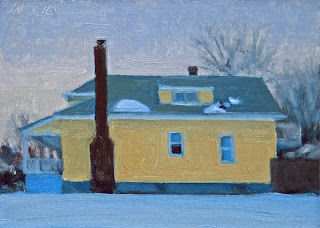 Today's daily painting is a winter scene of a Naples Yellow house seen at dusk. 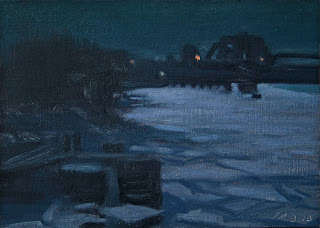 It was a challenge to capture all the subtle shifts of color and value in this painting. 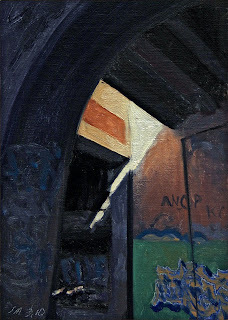 looking up under a bridge that spans the below grade railbed. 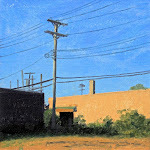 I was really taken with the sliver of light penetrating the darkness illuminating the graffiti tags below. 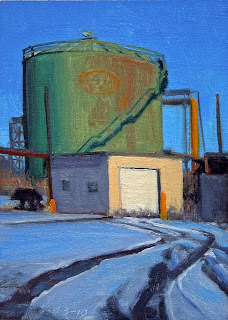 Today's painting is an industrial landscape near the Detroit River. 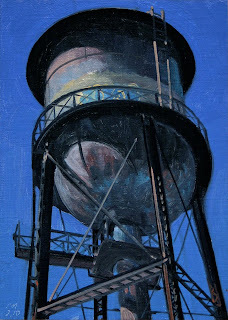 Today's daily painting is a view of one of the water-tanks in the last painting. 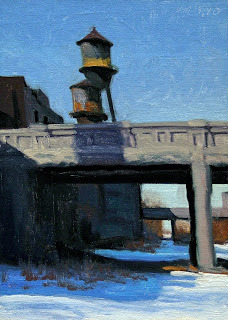 One of two sister water-tanks along the Dequindre cut in Eastern Market. 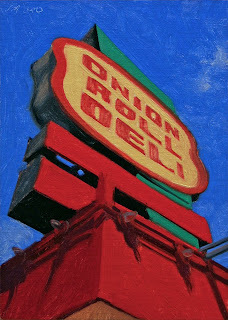 I just love the sharp contrast of the dark under belly and graffiti against the crisp blue sky. in Brush Park. 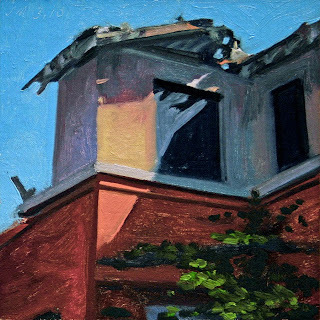 I was really interested in the abstract shapes and color created by the strong sunlight and shadows on the different surfaces of the building. 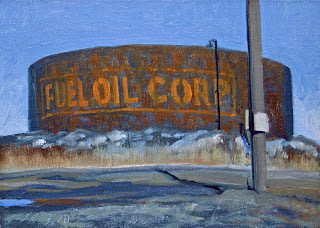 in the foreground and part of the Rouge Plant in the background. 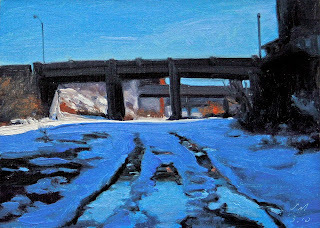 the Dequindre Cut rail bed in Eastern Market. 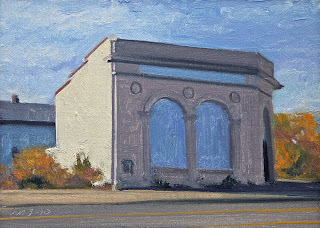 Today's daily painting is a view of the Dequindre Cut rail bed in Eastern Market. 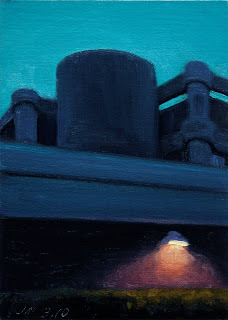 As I was exploring this area I met Johnny, one of three homeless men living under these overpasses. 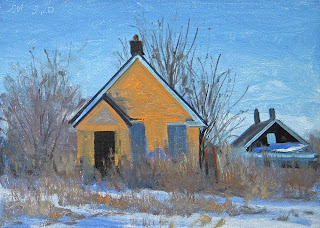 It is hard to see our brothers living in these conditions, a reminder that it is still very hard times for many in this country.